This is an era of standard-based teaching, with lots of curriculum to cover in very little time. Teachers are pressured to make tough decisions that will have a serious impact on their students' education. We can't do it all, so what subject matter shall we prioritize? What's most important? If it's not likely to be on "the test", can we afford to spend time on it? Something has to give, and creative writing is all too often the first candidate for the chopping block. It's a subject that doesn't fit well into a standardized test. It's tricky to grade. Its value is difficult to justify by means of the standard research data. 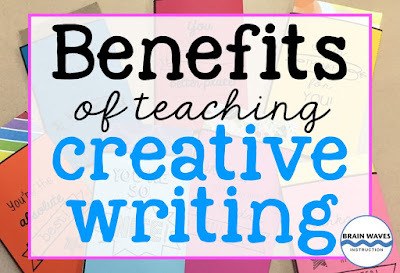 In fact, the value of creative writing has also been called into question by some Common Core designers. These leaders see the emphasis on "self-expression and emotion" that's associated with creative writing as being somehow detrimental to "lucid communication". These developments are unfortunate for a number of reasons. Creative writing does, indeed, allow for self-expression and emotional release - benefits that shouldn't be disregarded. Much has been written about the psychological and emotional benefits of creative writing. 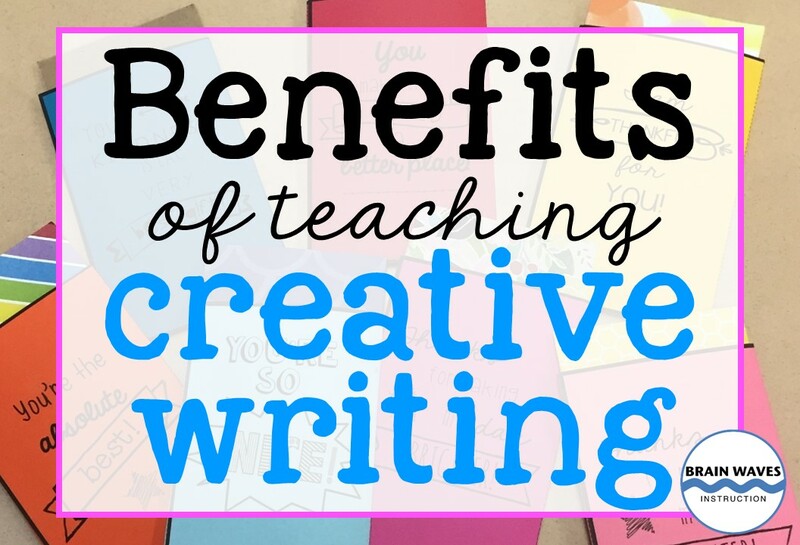 Let's take a look at some of these practical values of creative writing, and consider some arguments for keeping it in our classrooms! It has been shown in studies that children who have the opportunity to study creative writing improve their performance in other subjects. Math, science, and language studies skills have all been shown to benefit from practice in creative writing. Writing encourages broad, creative thinking and helps build a problem-solving mindset that is open to multiple alternatives. In other words, kids who write regularly tend to become innovative analytical thinkers. This skill translates well to study of any subject, and will also benefit the student in their later career. Speaking of writing regularly, it's easy to add some quick creative writing lessons into any class period with this set of 5 FREE Creative Writing Lessons. The language of literature is different from what's used in day-to-day writing and conversation. Creative writers get a chance to experiment with new words and unfamiliar turns-of-phrase. Students can take time to find the word that conveys their thought with the greatest clarity, precision and style. This is an excellent mental exercise. It's also fun! Students who build their vocabulary through creative writing go on to become adults who communicate clearly and vibrantly. This is a skill that's valued in the workplace, and earns the respect of colleagues. Get students building their vocabulary with this set of 101 This or That Writing Prompts. Students get to choose the writing prompt that appeals to them as they develop their skills as a writer! The creative writing class experience involves group review of a student's work. Creative writing students learn to accept constructive criticism, and to use it to improve their work. Students are also given the opportunity to analyze the work of others, to weigh its merits, and to offer thoughtful, respectful guidance. This ability to work cooperatively in a group setting will prove to be invaluable in adult life. Students can practice the skill of peer editing and review as they review creative myths, fables, or even persuasive advertisements. Giving students a chance to work together and build a community of writers is a wonderful and essential part of creative writing. Creative writing gives students the chance to assert themselves and their opinions, and to develop their “voice.” This, along with the opportunity to see their own words on paper, helps to build self-confidence. Students who regularly put their thoughts out for their fellows to read, and even criticize, are less intimidated by other challenges. A student who has gained confidence and found his or her own unique voice through creative writing is better equipped to succeed in the adult world. I saw some of the greatest growth in my students during my favorite poetry writing unit. Giving students a chance to write creatively as they experiment with different styles of poetry builds such confidence! In a standards-based and data-driven educational environment, it's not always easy to justify the need for creative writing. It's also not necessarily an easy topic to teach. However, for all of the reasons above, I feel that it's well worth the effort to include creative writing in our regular curriculum. In addition to the well-documented emotional benefits and "soft skills" it encourages, creative writing also develops a range of practical skills that are valuable in adult life. 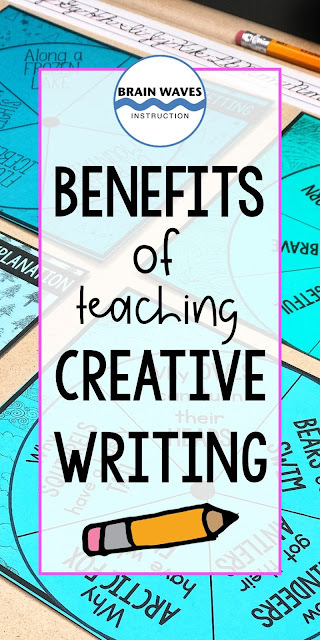 I hope you've found some great reasons to teach creative writing! P.S. Be sure to sign up for a free set of Creative Writing activities here!